It is with great pleasure that we record the election of Srimat Swami Gahananandaji Maharaj as President of the Ramakrishna Math and Ramakrishna Mission at a meeting of the Board of Trustees of the Math and the Governing Body of the Mission held on 25 May 2005. He is the fourteenth President of the Order. Swami Gahananandaji was one of the Vice Presidents of the Math and Mission since 14 April 1992, and succeeds Swami Ranganathanandaji Maharaj, who attained mahasamadhi on 25 April 2005. Born in the village of Paharpur in Sylhet district (now in Bangladesh) in October 1916, Swami Gahananandaji studied the lives and teachings of Sri Ramakrishna and Swami Vivekananda during his student life, and was deeply attracted towards them. 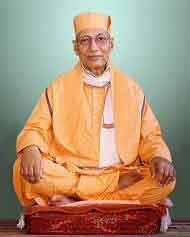 He was also greatly influenced by the dedicated lives of some of the monks of the Ramakrishna Order, especially the late Swami Prabhanandaji (Ketaki Maharaj), who was his cousin in pre-monastic life. He had also once met Swami Abhedanandaji Maharaj, a direct disciple of Sri Ramakrishna. Swami Gahananandaji joined the Ramakrishna Order at its Bhubaneswar centre in January 1939 at the age of twenty-two and received mantra diksha from Swami Virajanandaji Maharaj, the then President of the Order, after two months. In 1944 Swami Virajanandaji Maharaj gave him brahma-charya vows and the name Amritachaitanya, and in 1948 sannyasa vows and the name Gahanananda. At Bhubaneswar, he worked under the inspiring guidance of Swami Nirvananandaji Maharaj (later a Vice President of the Order). He also got opportunity to serve Swami Shankaranandaji Maharaj (later the seventh President of the Order) and Swami Achalanandaji Maharaj (a disciple of Swami Vivekananda and a Vice President of the Order) when they visited Bhubaneswar and Puri. From 1942 to 1952 he served at the Kolkata branch of Advaita Ashrama, Mayavati. In the course of those ten years, he went to the Mayavati ashrama in the Himalayas a couple of times to stay in solitude and spend time in study and meditation. Between 1953 and 1958, he was at the Shillong centre, where he worked under the guidance of Swami Saumyanandaji Maharaj (a disciple of Swami Brahmanandaji Maharaj). During this period he also organized flood relief operations in Assam a couple of times. Keenly interested as he was in the service of sick people, Swami Gahananandaji was posted to the Mission’s hospital centre, Ramakrishna Mission Seva Pratishthan, Kolkata, in 1958. For twenty-seven long years, he was deeply involved in all its activities as an Assistant Secretary under the inspiring guidance of its founder secretary Swami Dayanandaji Maharaj during the first five years, and then onwards as its head for twenty-two years, till 1985. The Seva Pratishthan was originally started, and was known for several years, only as a model maternity and child welfare centre. The vast and multifaceted form that the centre assumed in later years was largely achieved under the stewardship of Swami Gahananandaji Maharaj. He worked tirelessly to develop and expand its services to cater to the medical needs of more and more people belonging to poor and low-income sections of society. During his stay there, he started health-care activities in thirty-three remote villages through mobile medical units, free eye-operation camps in nearby villages, and medical relief for Gangasagar Mela pilgrims every year. He also organized medical-relief work for the refugees during the 1971 Bangladesh war. Swami Gahananandaji was elected a Trustee of the Ramakrishna Math and a Member of the Governing Body of the Ramakrishna Mission in 1965. In 1979 he was appointed an Assistant Secretary of the twin organizations. Even after that, he continued to shoulder the responsibilities of the Seva Pratishthan as its Secretary till March 1985. Thereafter he came to the headquarters at Belur Math to function as a whole-time Assistant Secretary. He became the General Secretary of the Math and Mission in 1989 and continued in that post for three years till 1992, when he became a Vice President of the Order. From that time he was also simultaneously the head of Ramakrishna Math (Yogodyan) in Kankurgachhi, Kolkata. As a Vice President, Swami Gahananandaji travelled extensively in various parts of the country and visited many branches of the Math and Mission and also a number of unaffiliated centres. In 1993 he represented the Ramakrishna Order at the commemorative function organized by Council for a Parliament of the World’s Religions in Chicago (and attended by 6,500 people from all parts of the world) to celebrate the centenary of the 1893 Parliament of Religions where Swami Vivekananda made his historic appearance. During that time he also visited the centres of the Order in the US and Canada. He also visited at different times various places in the UK, France, Switzerland, Holland, Russia, Australia, Japan, Myanmar, Sri Lanka, Bangladesh, Singapore, Malaysia and Mauritius. In all these places, Swami Gahananandaji Maharaj spread the message of Sri Ramakrishna, Sri Sarada Devi and Swami Vivekananda, and also gave mantra diksha to thousands of spiritual seekers. He always responded to requests for spiritual guidance from all corners of the country, including very remote villages, ignoring his personal difficulties and inconveniences. We earnestly pray for the continued fruition of his spiritual ministrations and steady growth of the activities of the Order under his guidance.